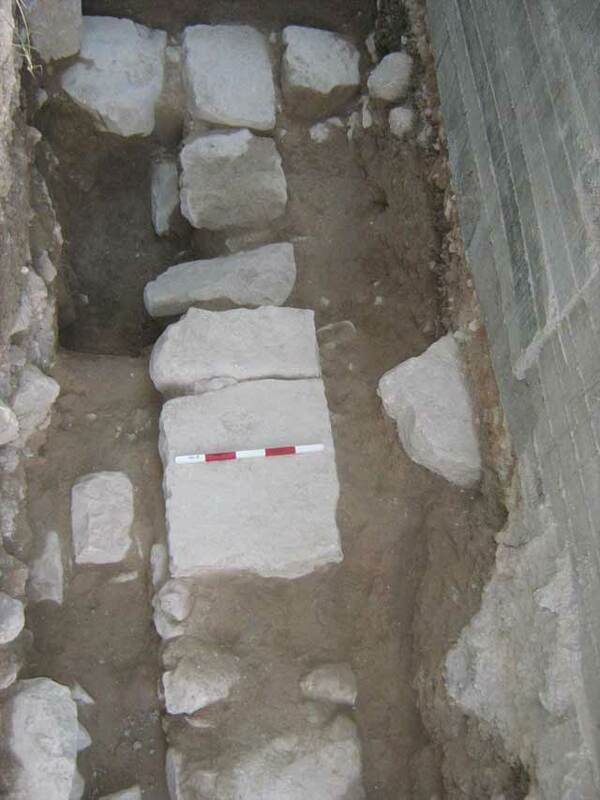 During June 2010, a salvage excavation was conducted at Tel Nahf (Permit No. A-5931; map ref. 23002–3/760060–5), prior to construction. The excavation, undertaken on behalf of the Israel Antiquities Authority and underwritten by the Abbas family, was directed by R. Abu Raya (field photography), with the assistance of Y. Ya‘aqobi (administration), R. Mishayev and M. Kahan (surveying and drafting), H. Tahan-Rosen (pottery and glass drawing), Y. Kupershmidt and G. Beiner (metallurgical laboratory), G. Bijovsky (numismatics), Y. Gorin-Rosen (glass) and N. Getzov (ceramics). A rectangular area was opened at the southeastern end of the tell (c. 2×11 m; Fig. 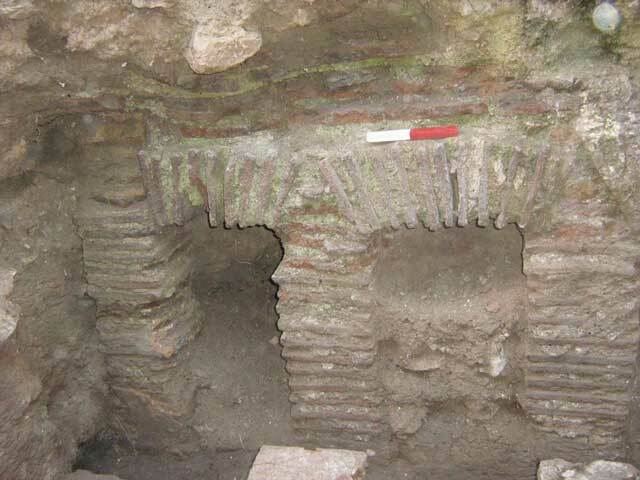 1) and remains of a Byzantine bathhouse were exposed, including part of the heating system, wall sections and a cistern. 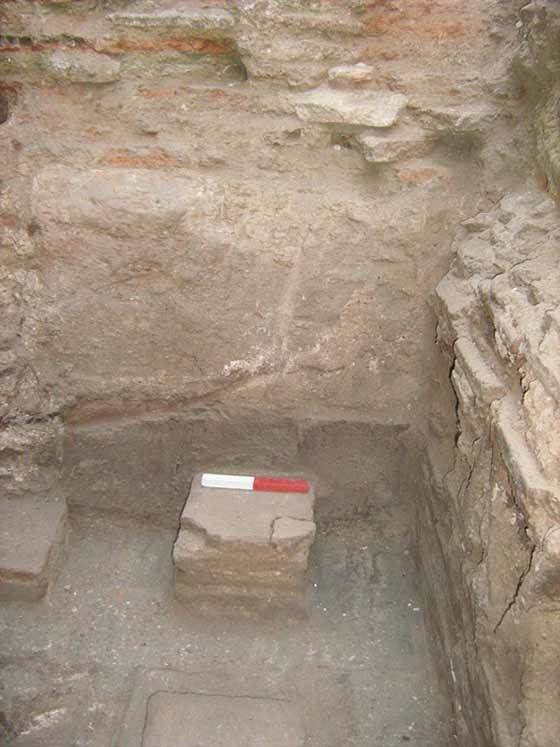 Previous excavations had been conducted in the vicinity (Fig. 1: C, HA-ESI 119; Fig. 1: D, HA-ESI 121; Fig. 1: E, HA-ESI 124) where remains dating to the Early Bronze Age and the Hellenistic period were exposed (Fig. 1: A, Permit No. A-3441), as well as a pottery workshop from the Roman and Early Byzantine periods and architectural remains from the Umayyad and Mamluk periods. Two bathhouses had been excavated in the region of Rama (Fig. 1: B; Tzaferis 1980) and at Kabul (HA-ESI 125). Two sections of parallel walls, 8.5 m apart, were exposed (Fig. 2). The western wall (W1; 0.4×0.8 m, height 0.3 m) and the eastern wall (W2; 0.5 ×1.5 m, height 0.4 m) were built of hard limestone and delineated a bathhouse complex in whose center was the hypocaust (heating system). 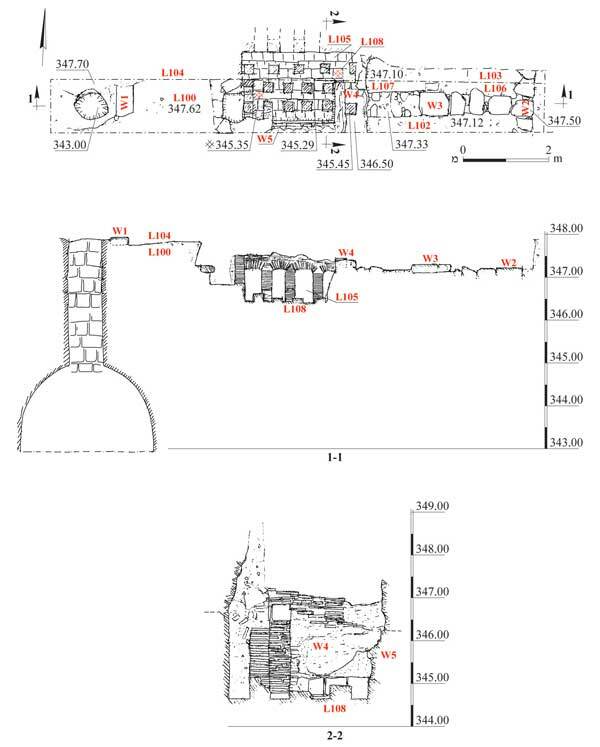 Part of a wall (W5; height 0.8 m) built of ceramic bricks was exposed, as well as another wall (W4; 0.5×1.6 m, height 1.25 m; Fig. 3) whose upper part (c. 0.4 m) was constructed from square ceramic bricks (c. 0.33×0.33 m, thickness c. 0.03 m) and it lower part (c. 0.8 m high) was built of large soft limestone ashlars coated with light pink plaster that contained grog. The plaster was covered with a row of square ceramic tiles that survived along the bottom of the wall. Walls 4 and 5 delineated the hypocaust on the south and east. 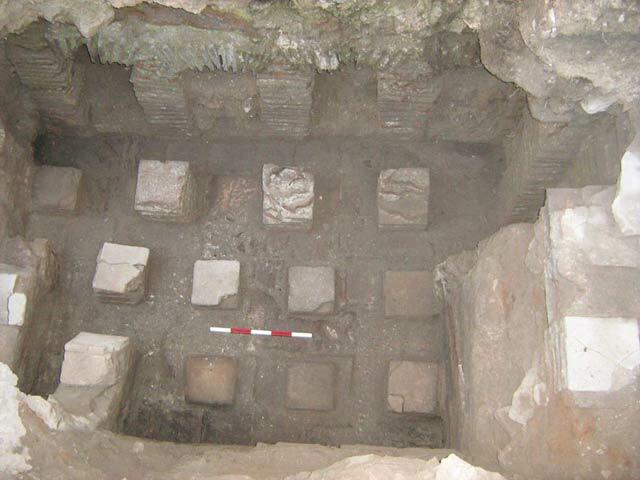 The floor of the hypocaust (L108), found in situ, was built of different size square ceramic tiles. 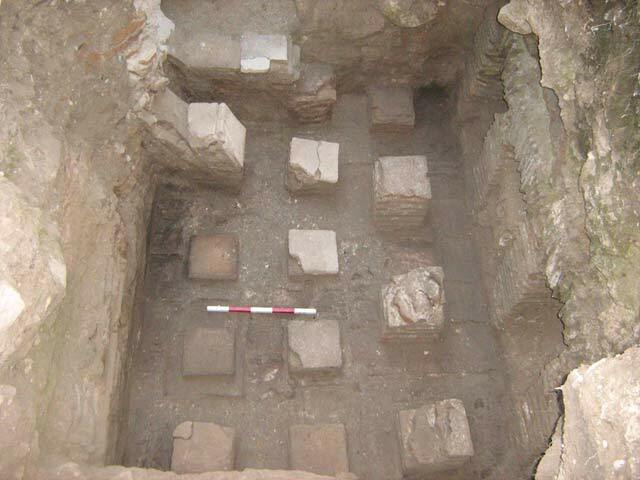 The remains of rows of hypocaust colonnettes were revealed above the floor (Figs. 4, 5). These survived in their entirety in the northern row (height 0.8 m) and supported a row of arches (thickness c. 0.2 m) that were built of ceramic bricks similar to the colonnettes. The arches bore a floor of ceramic tiles (thickness c. 0.15 m; Fig. 6). A wall (W3; 0.5×3.8 m, height 0.6 m) built of hard limestone was bonded with W4 in the west and W2 in the east (Fig. 7). A bell-shaped cistern whose interior was open and contained soil and stones was documented west of W1 (depth c. 5 m). A round opening (diam. c. 0.8 m) led to a shaft (length c. 3 m) built of medium and large limestone on which remains of light gray hydraulic plaster were noted. Fragments of pottery vessels dating to the Late Byzantine period (sixth and early seventh centuries CE) were found, including bowls imported from Cyprus (Fig. 8:1), western Turkey (Fig. 8:2) and North Africa (Fig. 8:3, 4), a locally produced bowl (Fig. 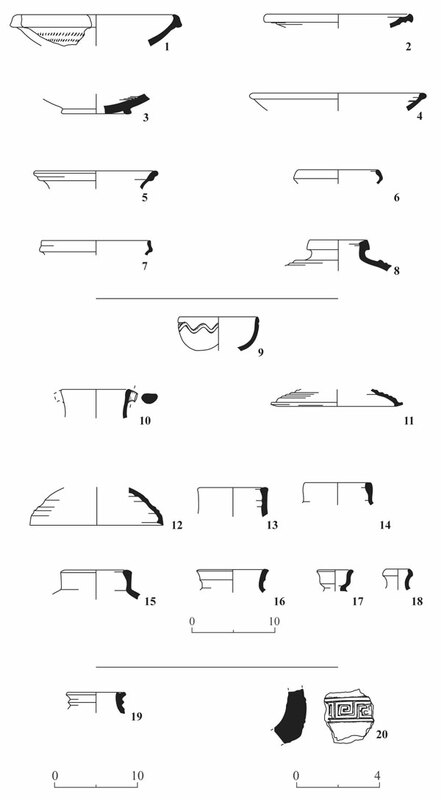 8:5), rims of closed cooking pots with a carinated neck (Fig. 8:6, 7) and a jar (Fig. 8:8). These were found together with a diverse assemblage of potsherds that dated to the beginning of the Umayyad period (second half of the seventh–first half of the eighth centuries CE), including a BFW, thin-walled, deep bowl adorned with a wavy line on the outside beneath the rim (Fig. 8:9), a closed cooking pot rim (Fig. 8:10), rims of cooking pot lids (Fig. 8:11, 12), jar rims (Fig. 8: 13–16) and flask rims (Fig. 8:17, 18). Potsherds found close to the surface included a fragment of a Mamluk jar (Fig. 8:19) and a body fragment of a thick-walled jar decorated on the exterior with a meander pattern (Fig. 8:20). 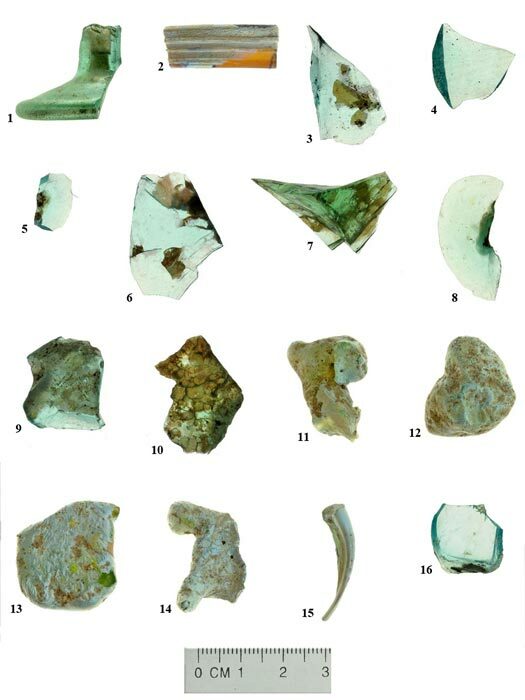 The glass artifacts are important because of debris from the production of blown vessels that was found with fragments of glass vessels dating to the Late Byzantine–Early Umayyad periods (see glass below). A folles of Heraclius, struck at the mint of Constantinople (629–630 CE; IAA 140779), was found near the floor of the hypocaust. The bathhouse was probably built in the Late Byzantine period; it continued to operate in the Umayyad period and ceased to function in the latter part of that period. Sixty-five glass fragments and waste were found in the excavation, of which half are body fragments that cannot be identified and dated. Three baskets were found in L105 and one basket in L106. The glass material of waste and that of the vessels are similar in color and quality; it can therefore be assumed that they are contemporaneous. The identified vessels are fragments of wine goblets that have a hollow ring base and a cylindrical stem, which are characteristic of the Byzantine period (Fig. 9:1); a fragment of this type of base was discovered in each of the baskets from L105. Small pieces of rims that belong to wine goblets were discovered together with the bases. Also found were a small fragment from the end of a hollow conical stem lamp of the same period, a fragment of a bottle neck adorned with trails and a fragment of a yellowish brown bracelet decorated with four ridges (Fig. 9:2). The weathering on the bracelet is silvery gold and the cross-section is elongated and narrow. This type of ridged bracelet dates to the fifth–seventh centuries CE (Spaer 2001:199, No. 449, Pl. 33:449). Three similar bracelets made of brown glass were recently discovered in a tomb at Kabul and are dated to the second half of the fourth–early fifth centuries CE (Vitto 2011:119–120, Fig. 12:5–7). 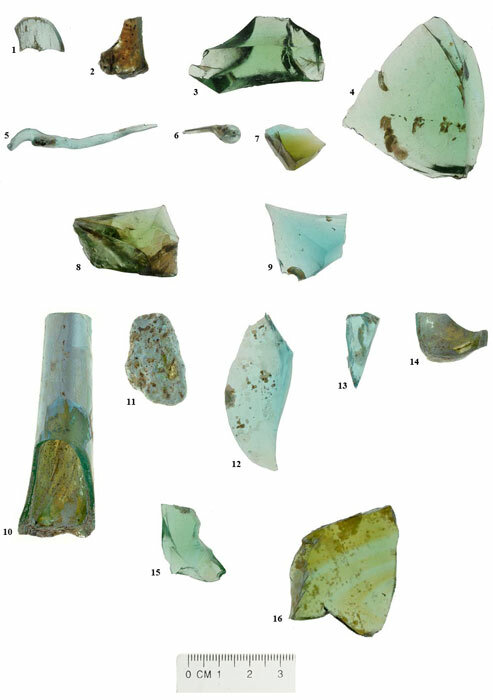 The glass industrial waste was present in the four baskets and comprises flakes of raw glass that is mainly greenish blue, light green or yellowish green in color (Figs. 9:3–10, 10: 3, 4, 7–9, 12, 13, 15, 16). These flakes, used as raw material in the kiln, were melted and blown into vessels. Glass fragments distorted by the heat (Figs. 9:11–14; 10:11) are usually waste glass that was removed with tongs from the glass that was taken out on the blow pipe or drops of debris that were thrown off during the blowing process. In addition to these, several glass pendants that are drop-shaped or trail-like with a thickened end were found (Fig. 9:15, 10:5, 6). These are also hot glass that was taken out of the kiln and cooled. The most distinctive debris attesting to glass-blowing is called moils (Fig. 9:16; 10:1, 2, 10, 14), which is a result of blowing vessels and severing the vessel from the blow pipe. Those that were found in the excavation characterize the waste produced from blowing bottles with necks. One of them (Fig. 10:10) is the most complete example found to date in the country; its upper part, where it was connected to the vessel, is cut and on the other end are remains of metal and its separation from the blow pipe. Most of the moils that were exposed in excavations are of a shorter kind, like all the other moils from this excavation, which are characterized by a triangular cross-section with remains of metal from the end that was connected to the blow pipe. It is presumed that a workshop operated at Nahf where blown glass vessels were produced during the Byzantine period. 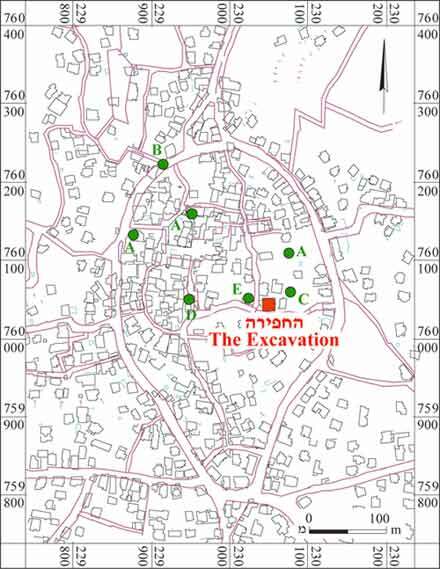 A workshop dating to the Byzantine period was exposed at Bet She’an next to the main road that descends from the northeastern gate to the foot of Tel Iztabba toward the severed bridge and the road that leads into the city (ESI 17:27). This workshop was well-preserved and inside it were the furnace, raw material and a large quantity of its products, among them wine goblets similar to those found at Nahf, lumps of raw glass and blown glass debris. Spaer M. 2001. Ancient Glass in the Israel Museum:Beads and Other Small Objects. Jerusalem. Vitto F. 2011. An Early Byzantine Period Burial Cave at Kabul. ‘Atiqot 66:107–136. 3. Wall 4, looking east. 4. The hypocaust, looking north. 5. The hypocaust, looking west. 6. Colonnettes and arches of the hypocaust, supporting a ceramic tile floor, looking north. 7. Wall 3 bonded with Wall 2, looking east.